"...it makes no sense whatever to say what the judge imputes, imparts, bequeaths, conveys or otherwise transfers his righteousness to either the plaintiff or the defendant. 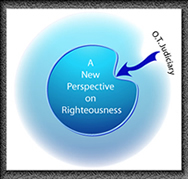 Righteousness is not an object, a substance or a gas which can be passed across the courtroom..." (What Saint Paul Really Said, p. 98). 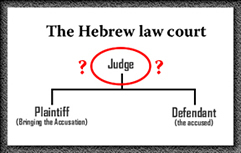 "...as to the details of the Jewish courtroom, we must note that there are problems with Wright's presentation of this courtroom scene, both as a historical reality and as an earthly parallel to God's own judiciary. This is important because his errors yield serious misconceptions concerning the contents of, and the actions taken, in God's judiciary. A careful examination of Scripture shows that Wright fails to "unpack" all of the components of God's courtroom, and this renders a corruption of his notion of forensic justification. Thus, our examination of Christ's forensic justification will begin with the O.T. Scriptures, but then by the Law's pedagogy we will turn to Christ in the N.T. in order to come to a proper understanding of the full counsel of God – something that the Apostle Paul was dedicated to with his very life. By doing this, we are in fact imitating Paul's own wisdom as expressed in Galatians 3:24. What better way might a person come to discover what Paul really meant and said?..." The details of this section are essential in order to see, not only the failure of Wright's resultant logic and exegesis, but also the faulty nature of his process of analysis. Exegesis, by definition, is the process by which an interpreter's instruction is derived out (ex) of the text; rather than the interpreter offering an instruction which infuses his own thinking into (eis) the text. Chapter two sadly affirms, yet again, that Wright's commitment is to the latter process, rather than the former.